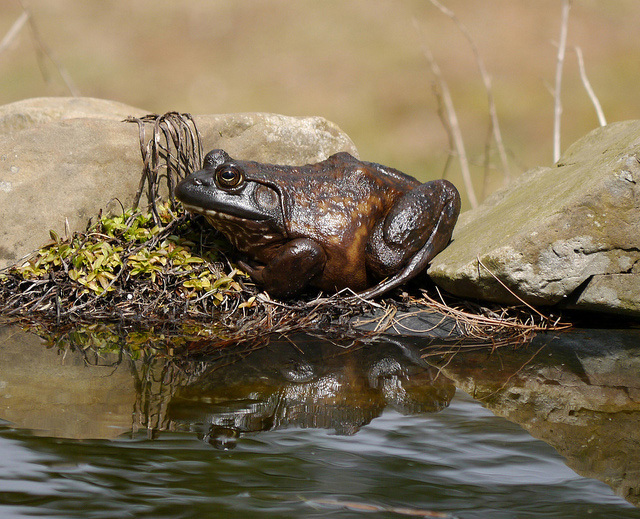 The bullfrog (Lithobates catesbeianus, formerly Rana catesbeiana) is the largest frog in North America. Bullfrogs eat a variety of insects, crayfish, mice and other frogs. There have also been reports of bullfrogs eating snakes, turtles, birds and even bats! 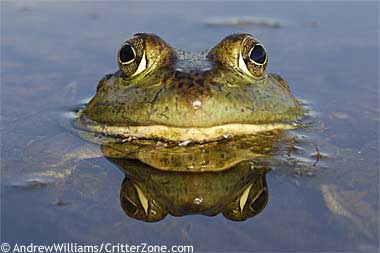 The bullfrog's deep calls during the mating season (May - July) can be heard up to one mile away. Female bullfrogs lay thousands of eggs, which float like a film on the water. The eggs hatch into tadpoles 3-6 inches long. 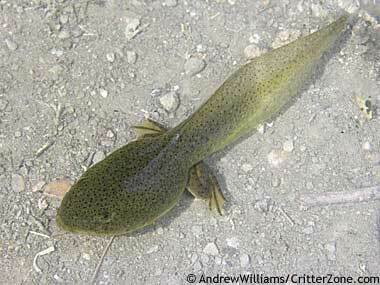 The metamorphosis from tadpole to frog takes between one to three years. Bullfrogs live between seven to nine years, with a maximum of eleven years.